The Larry Ramirez Allstar Award was named for Tri-Community resident. For those of us who knew Larry Ramirez, we remember him as being kind, considerate and funny. 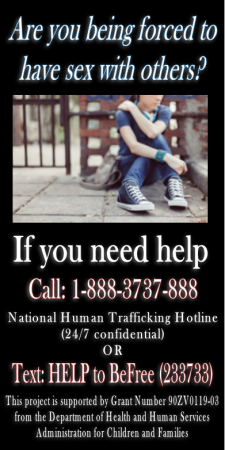 He always had a smile on his face and was willing to help you or your organization. 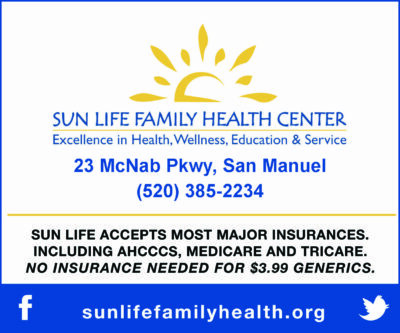 He was community-oriented and helped many organizations and people in the Tri-Community and surrounding areas with his work with the Mammoth-San Manuel Community Schools and as a Town Council member in Mammoth. In the last few years of his life, he continued his friendly and helpful ways while working at the Oro Valley Home Depot store #481, 10855 N. Oracle Rd. 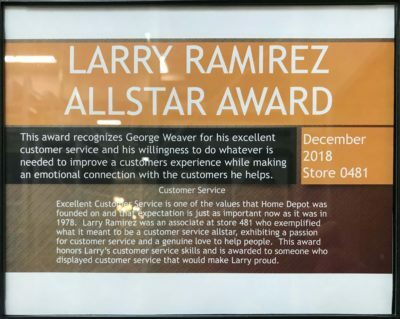 Larry was so good at his job and helping others that the Employee of the Month Award at the store has been renamed the Larry Ramirez Allstar Award in his honor. Jason said that Larry had received Employee of the Month on the month that he passed away. Rest in Peace, Larry. The Tri-Community and many others will miss you.